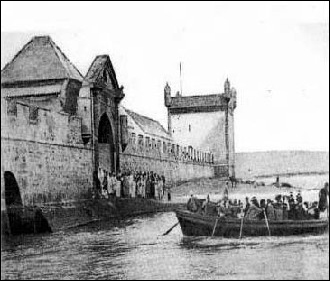 In the 18th century many visitors came to Mogador by ship and entered the medina by the great gateway Bab El Mersa of Scala the Port, which was ordered to be built in 1766 by Sultan Sidi Mohammed Ben Abdellah the founder of the modern city of Essaouira. But the Mogador Bay and its islands have been occupied since prehistoric times. 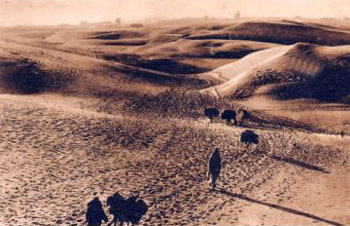 Morocco was in early history time inhabited by the Imazighen (known as Chleuh - an ethnic Berber group). Archeological research show that they have been fishing in The Mogador Bay, 2000 to 3000 BC. The Mogador Bay is almost closed by the large Island of Mogador, making it a relatively peaceful harbour protected against the strong winds of the area. The site has long been considered as one of the best anchorages of the Moroccan coast. The rich fishing waters and the access of fresh water was valuable assets. The supply of wood and stones facilitated the building of fortifications. Mogador was a perfect base for further explorations south at the African coast and west at the Atlantic. In the 6th century BC, the Phoenicians founded a settlement at the island and they named it Migdal , Migdol ("watchtower"). 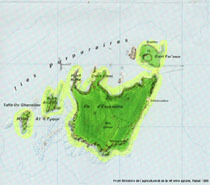 They also established an production facility for indigo die (Royal blue) on the Island (Iles Purpuraires). 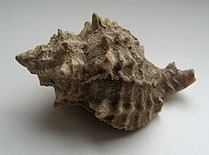 The sea snail harvested for this production was Hexaplex trunculus also known as Murex trunculus. Murex brandaris and Purpura hemastoma was other purple shells. Hanno the Navigator (also known as Hanno II of Carthage) was a Carthaginian explorer (500 BC), best known for his naval exploration of the African coast, visited Mogador and started iron mining at Jbel Hadid. 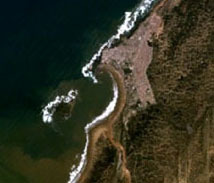 The Islands of Mogador (Iles Purpuraires) acquired some reputation in the Roman Empire and the King of Maurtania, Juba II, (Yuba in Imazigh) sent a contingent to "the Purple Island" to re-establish the ancient Phoenician dye manufacturing process. The major influence on Moroccan culture is Islam, brought to North Africa by the Arabs. They began bringing their civilization in the 7th century and the Alaouite dynasty, which claims descent from the Prophet Mohammed, has ruled Morocco since 1649.
connecting with the Haha Berbers and Chiadma Arabs. The historians during the middle ages describes the site as a fortified town and a place of wintering for the navigators on the river of Amkdour (Oued Ksob). In 1506, the king of Portugal, D. Manuel I ordered a fortress to be built in Mogador, named "Castelo Real de Mogador" but the Portuguese only stayed in Mogador for 19 years. Local people then controlled the site.During the 16th century, various powers including Spain, England, the Netherlands and France tried in vain to conquer Mogador. It is said that Essaouira remained a haven for the anchoring of pirates. The town revived with the Sultan Sidi Mohammed Ben Abdellah who let build the Scala fortifications and the port and create a prosperous environment for commerce and trade. Essaouira became a meetingplace of many cultures; the Arabs, the Jews ,the Amazigh and nearly a thousand Europeans (British, Danish, Dutch, French, Germans, Italians, Portuguese and Spanish) who had consulates in the Kasbah of the medina (the old town). Mogador was the most important trading port of Morocco until mid 19th century. During the French protectorate 1912 - 1956, Casablanca grew up in the North and Agadir in the South and there were better ports built for modern ships. Essaouira was known as Mogador during the French protectorate 1912 - 1956. With the independence of Morocco, the town took the official name of Essaouira! 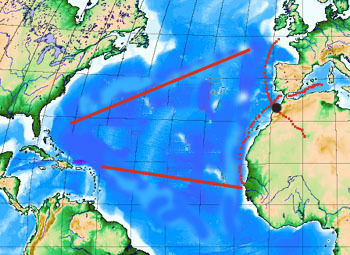 But the name Mogador appeared for the first time in the world map of Medici in 1357 and on a map designed by Pizzigani 1367 and the Portuguese called it Mogadouro and the Spanish Mogadour - Mogador. The name Essaouira originate from when the Sultan Sidi Mohammed Ben Abdallah renewed the city and called it Souira (Souera) 1767.
there are a carved inscription in sandstone. about divine protection of the town. Archeological research shows that The Island of Mogador has been occupied since prehistorical times. A pottery, found on the island of Essaouira signed name of the Carthaginian admiral Magon, attests the presence of the Carthaginians around the city towards 630 before-JC. The disgusting origins of the colour purple. 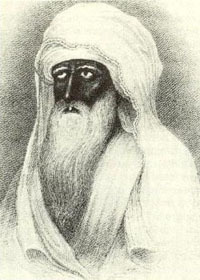 The Sultan Sidi Ben Abdallah (1757-1790) also settled a large number of Jewish merchant families (the tujjâr al-sultân , or “sultan's traders”) in Mogador in order to take better advantage of their business connections with Jewish merchants in European cities such as Livorno, Liverpool, and Amsterdam. 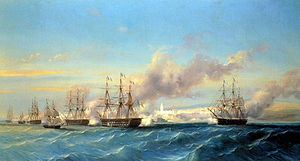 The attack of Mogador by the French fleet, Serkis Diranian. 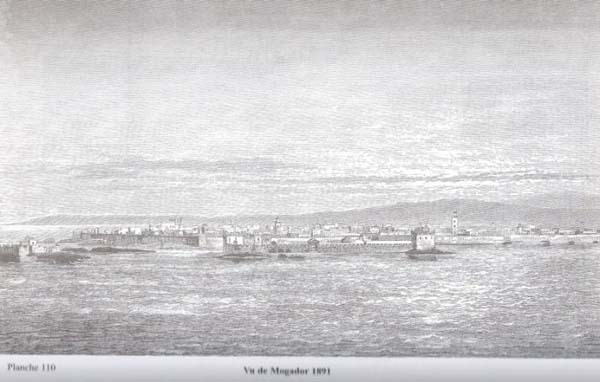 The Bombardment of Mogador took place in August 1844, when French Navy forces under the Prince de Joinville attacked the Moroccan city of Mogador, modern Essaouira, and the island facing the city, Mogador island. The campaign was part of the First Franco-Moroccan War. we see the Island of Mogador, the port with Castelo Real and the drawing of the Kasbah.